Although it doesn't have conventional looks, the Ping Scottsdale Grayhawk is -to my eye at least - an attractive putter which has the major advantage of a hollow head. That advantage is a larger sweetspot, caused by the fact that more weight is distributed at the edges of the head design. This larger sweetspot gives greater stability through impact, especially on off-center contacts and - the only thing we're really interested in - more putts on the intended line. This putter compares favorably in the looks department when put alongside other hollowed-out heads such as the Yes Eleanor-12 or Yes Natalie because the plate of metal which sits underneath the aimline gives the putter a feeling of solidity. It's hollow, but it doesn't look it, if that makes sense! Another thing that appealed to me was the super-long aimline. It stands out beautifully and the club sits consistently square too. Both of these factors are likely to give you great confidence when you're standing over the ball. Ping also appear to have worked hard on getting the sound and feel of this putter just right, too. Whereas hollow putters generally have a very tinny feel and produce an extremely loud ringing sound, the Ping Scottsdale Grayhawk makes only the very slightest hollow sound and I'm sure you could get used to it quickly. 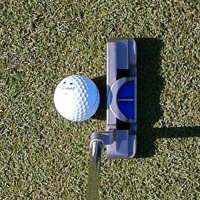 The weight of the head and the fact that all the weight is positioned in the edge of the putter gives you a very solid feel through the ball, there is no feeling of deviation on an off-center strike, so I'm a fan of the feel too! The roll from the Grayhawk is another strength, as indeed it is from all Ping putters. A futuristic putter which has great feel and roll and looks that would not offend even the traditionalists eye.